Sunflower seeds are the seeds of sunflowers, large flowering plants which are native to North America. Many people eat sunflower seeds as a snack around the world, and they are reasonably nutritious dietary supplement, as long as they are eaten in moderation and not heavily salted. Sunflower seeds are also used in seed mixtures for birds, and they may appear in bird feeders or feeds for pet avians. Most markets sell sunflower seeds, usually in both shelled and unshelled forms, and they are often used as filler in trail and nut mixes. The sunflower, or Helianthus annuus, is a distinctive annual plant which produces large bright yellow flowers which resemble small suns. The flowers grow on tall stalks with simple leaves, and they have been known to reach the height of nine feet (three meters) in ideal growing conditions. In fact, the head of a sunflower is composed of a tightly compacted mass of small flowers, each of which matures into a kernel surrounded by a dry husk. Incidentally, sunflowers are often used to demonstrate the appearance of Fibonacci sequences in nature, since the arrangement of seeds exhibits mathematically predictable symmetry. Native Americans realized the potential of sunflower seeds as a food source several thousand years ago, and they have been growing them ever since. When European explorers first visited the Americas, they brought seeds back with them to attempt cultivating sunflowers on their own. In addition to serving as a food source, sunflower seeds can also be pressed for oil and used for animal fodder for some species. Most producers classify sunflower seeds by the color of their husks. 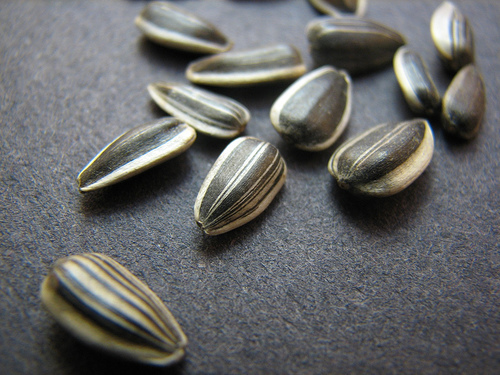 The seeds may come in black, striped, or white husks, with striped sunflower seeds being the seeds most commonly eaten. When cracked open, each hull yields a single small kernel which is about the size of a pinky nail. The seeds are creamy white in color, and high in protein and several essential vitamins and minerals. Culinary sunflower seeds have a lower oil content than those cultivated for oil, but they have enough to have a rich flavor. Many people eat sunflower seeds out of hand, usually shelling them as they eat them. This causes issues of public hygiene in some parts of the world, which is why travelers sometimes see signs exhorting sunflower seed eaters to clean up their messes. In many Mediterranean countries, sunflower seeds are sold fresh and roasted, wrapped up in paper for people to snack on while they attend different events and celebrations. Sunflower seeds are commonly used as garnish or ingredients in various recipes and snacks, and as a part of salads and cereals. Eating raw sunflower seeds can drastically improve the regulation of blood pressure in the body, unlike any animal protein. Sunflower seeds are immensely rich in unsaturated fat (about 90%). This may help keep the level of 'good cholesterol' high in the body, thereby countering the ill-effects on 'bad cholesterol'. These seeds are a rich source of vitamins, minerals and poly and monounsaturated fats. Here is a table showing you the nutritional values of raw sunflower seeds for a serving size of 100 g.
There are certain free radicals in the body that can damage cell membranes and even brain cells. To counter and neutralize such radicals, Vitamin E is required in adequate quantity and this can be ensured by taking raw sunflower seeds. Just a quarter cup of these seeds is enough to make up for about 90% of the daily requirements of this essential vitamin in the body. Adequate quantity of Vitamin E in the body also reduces chances of developing asthma, and rheumatoid arthritis (RA), colon cancer, and cardiovascular diseases. Apart from being a rich source of Vitamin E, raw sunflower seeds also contain linoleic acid (essential fatty acid), amino acids, and minerals. Amino acids, as we know, are the building blocks of proteins and the minerals contained in raw sunflower seeds include magnesium, potassium, zinc and calcium. Sunflower seeds being rich in phytosterols and a good source of dietary fiber, aid in reducing the cholesterol levels in the body. One of the important health benefits of sunflower seeds is prevention of the onset of depression. Low levels of serotonin (a neurotransmitter) results in increased levels of anxiety, tension and depression. This neurotransmitter is formed from an amino acid known as Tryptophan, which is one of the plentiful constituents in sunflower seeds. So the intake of raw sunflower seeds helps in the production of serotonin, which when released, has a calming effect on the nerves and relieves anxiety, and almost all forms of depression. Eating sunflower seeds helps in the production of selenium in the body, which in turn aids in keeping the cells from damage. Copper is also required by the body to help carry oxygen to the red blood cells. 25% of the daily requirement of this mineral is easily covered by one ounce of raw sunflower seeds. Raw sunflower seeds contain vitamin that is essential for cell growth and reproduction. It is known as folate, and it is responsible for the body's cells to manufacture DNA (deoxyribonucleic acid) and RNA (ribonucleic acid). The nutritional value of raw sunflower seeds that is contained in one serving (1/4 cup) includes 11.0 g of fat, 3.0 g of fiber and 6.0 g of protein. Raw sunflower seeds also provide the daily requirement of iron in the body, which comes to about 13%. Apart from containing Vitamin E, Vitamin B-6 is also an important part of raw sunflower seeds. The list does not end here! Raw sunflower seeds are also a rich source of Zinc, which helps the body recuperate from any kind of injuries, and fight infections. About 10% of the daily requirement of this element can be obtained from raw sunflower seeds. Most people may find it difficult to believe that something as simple as sunflower seeds may have so much to offer. So the best way to see and examine the benefits that these seeds have on your health, is to grab a handful of them and 'snack on' everyday! The various health benefits of sunflower seeds can be attributed to the high levels of polyunsaturated and monounsaturated fats, vitamin E, selenium, protein, copper, folates, iron, zinc and B vitamins that it contains. The most important health benefit of sunflower seeds is imparted by the polyunsaturated and monounsaturated fats that it contains. These components protect the heart against various heart diseases like blockage of arteries, by lowering cholesterol and eliminating bad cholesterol or low density lipoprotein. More than 90% of the fat, that sunflower seeds contain is unsaturated fat which help maintain high density lipoprotein. Sunflower seeds are an excellent source of vitamin E. Vitamin E rids the body of free radicals, that cause heart ailments like atherosclerosis and can also cause cellular damage. The vitamin E, contained in sunflower seeds have antioxidant properties and help in the rapid clotting of blood and healing of wounds, regulates the functioning of the circulatory system and reduces the risk of developing heart ailments and diabetes. Vitamin E also imparts anti-inflammatory properties to sunflower seeds, that is essential in the cure and reduction of arthritis symptoms. Selenium is an important trace mineral which works in conjunction with vitamin E to impart antioxidant properties, that prevent the formation of cancerous cells and heart problems. Selenium promotes DNA repair, induces apoptosis and synthesis of damaged cells. This is an important sunflower seeds health benefit. Sunflower seeds nutrition information points out, that the proteins that sunflower seeds contain, enable the supply of amino acids to the body. These amino acids are essential for the maintenance, growth and repair of tissues. Folate, also known as folic acid, is a type of B vitamin, that is very essential for pregnant women as it aids the production of new cells in the body by forming their DNA and RNA which is very important for the growth and development of the fetus. It works together with vitamin B-12 to form hemoglobin in red blood cells. Intake of folate also lowers the risks of developing heart ailments. Magnesium contained in sunflower seeds prevents the entry of calcium into the nerve cells, muscles and blood vessels which enables the prevention of muscle spasms and sudden nerve contractions. Magnesium also lowers blood pressure reduces and prevents asthma attacks and migraine headaches. As per sunflower seeds nutrition facts, they contain tryptophan, an amino acid that helps in the production of serotonin, which is an important neurotransmitter. Serotonin relieves tension, calms the brain and promotes relaxation. Sunflower seeds contain phytochemicals like choline, phenolic acids, lignan and betaine. Phytochemicals are plant chemicals, that are known to prevent heart diseases and the growth of cancerous cells, that cause breast colon and prostate cancer. Fiber that sunflower seeds contain, promote easy digestion and prevents constipation, lowers blood cholesterol levels and manages blood sugar levels. These fibers also help control weight and prevent obesity. The health benefits of sunflower seeds can be enjoyed by making them a part of one's daily diet. They can be consumed raw or toasted as a healthy, convenient snack or can be added to salads, breads and pancakes. They are easily available in stores and supermarkets and can be stored for long. Their consumption will ensure the prevention of a number of health problems and a long and healthy life. Sunflower seeds, produced by the large, yellow flowers of the sunflower plant, serve as a healthy snack choice when eaten in moderation. Because these seeds offer both convenience and nutrition, you may believe you can eat as many as you want. However, just as with anything, too much of a good thing may not be so good. Once harvested, the size of the sunflower seed determines the final product. The largest seeds sell in their shells -- meaning, the hard hull remains intact around the kernel; the medium-sized seeds have the hull removed, and the sunflower kernels are sold; and the smallest seeds go to the pet food and birdseed market, according to the National Sunflower Association. Chewing in-shell sunflower seeds has become a popular alternative to chewing tobacco, especially among sports players. Although a healthier alternative than chewing tobacco, eating too many seeds may damage your teeth over time. To avoid damage, don't always crack the seeds open with the same teeth, as this may damage the enamel or push on your gums, causing them to pull away from the teeth. Although the 2005 U.S. Dietary Guidelines recommend eating nutrient-rich foods, such as sunflower seeds, the National Sunflower Association says that eating too much of any one food type leads to an unbalanced diet. Sunflowers, considered a whole food source, serve as a good source of protein; dietary fiber; essential minerals, such as calcium and iron; and essential vitamins, such as vitamin E. However, a 1-oz. serving of raw unsalted sunflower seeds provides 160 calories. Eating handfuls of sunflower seeds in one day can therefore add a significant number of calories toward your daily caloric intake. Even with all the nutrients, the added calories may lead to unwanted weight gain. Diverticulosis describes a condition that usually affects the lower portion of the large intestine, known as the sigmoid colon. The lining of the intestines contains small pouches that can bulge through the weak spots. Doctors call the single pouches diverticula and diagnose those who have diverticula with diverticulosis. Diverticulosis affects approximately 10 percent of people who are older than 40, according to the National Digestive Diseases Information Clearinghouse. Doctors often recommend those with diverticulosis to avoid eating any type of seeds, such as sunflower seeds, especially in large quantities, as the seeds may become stuck or block the diverticula, leading to complications such as bleeding, an abscess or perforation of the intestines. Runny nose; watery eyes; sore eyes; itchy eyes; red eyes; cough; hives; asthma; lip swelling; tongue swelling; hoarseness; throat swelling; nausea; vomiting; diarrhea; itching; sneezing; wheezing; headache; sinus pain; itchy mouth; tingling mouth; breathing problems; facial redness; facial swelling; redness around lips; constipation; skin flushing; swallowing problems; abdominal pain; eczema; low blood pressure; disturbed sleep; and lightheadedness.